With these words, our Director of Photography, Richard Dallett, launched the taping of Steven Raichlen’s next Public Television show, Project Smoke. Three months ago, Project Smoke was barely an idea. 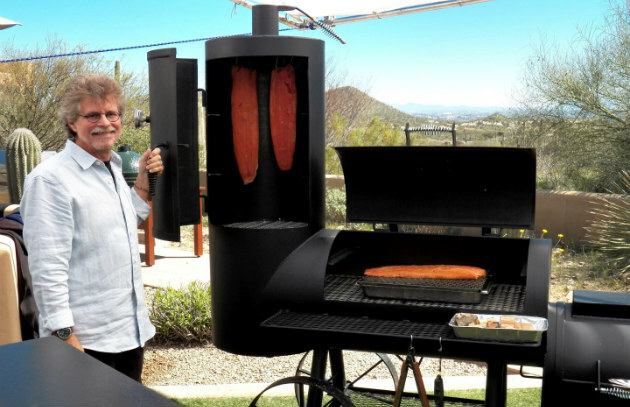 (That idea was to do for smoking and smokers what Primal Grill did for grilling.) By nightfall, February 20, a crew of 20 checked into our home for the next two weeks—the scenic JW Marriott Starr Pass Resort and Spa on the outskirts of Tucson, Arizona—to create a TV show. The next day, we erected a small tent city, complete with a field kitchen for the prep, control room for the production crew, photo studio for shooting “beauties” (lavish finished food shots), and workshop for assembling and maintaining the more than 30 smokers and grills we’d use for the show. Call time on the first day of shooting was just after sunrise. I was enthralled with the birdsong and imposing saguaro (pronounced “sa-wa-ro”) cacti along the serpentine walk from the hotel to the set. Steven was already on the set, too: you could hear his cheery “good mornings” as he greeted the crew. I shudder to think what time his day started: I’d often get emails at 4 a.m. with scripts and battle plans for each episode. 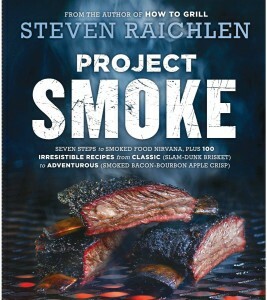 Many of the show’s recipes come from Steven’s new book—also called Project Smoke—and due out in April 2016 (Workman Publishing). 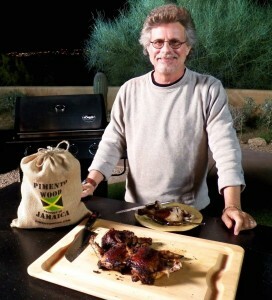 The rest come from this blog and from Steven’s award-winning books The Barbecue! Bible and BBQ USA (Workman Publishing). The next two weeks passed in a blur. The lime-green (and previously unused) pedometer I clipped to my jeans before shooting kept sending me congratulatory emails. I quit reading them after a few days—but not before earning the Penguin March Badge—for 70 miles—the length of the trip the emperor penguin makes to its breeding grounds. That’s alarming news to someone who spends most of her hours working from a comfy desk chair. Physically, my job (Recipe Coordinator) was perhaps less taxing than the other jobs. Videographers Richard, along with Michael and Gary, stood for long hours shouldering heavy cameras. Gaffer Ron and Best Boy Paul took care of the set’s electrical and lighting needs. Soundman Michael kept Steven “miked” and filtered out background noise. Our grill and fire wrangler, Andreas Langley, aided by Rob Baas (Barbecue Board member and our still photographer), unpacked, built, and moved grills literally as large as pianos. 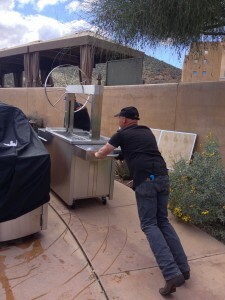 (Check out the photo of Andreas maneuvering the new $20,000 plywood-encased Kalamazoo rotisserie grill down the walk.) Stage manager Jillian Kuchman kept everyone on schedule. Then there were the mental jobs. 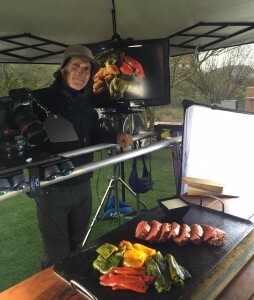 Steven had to write and deliver to the cameras smooth, energetic, and engaging intros to each recipe. It’s not as easy as it looks. 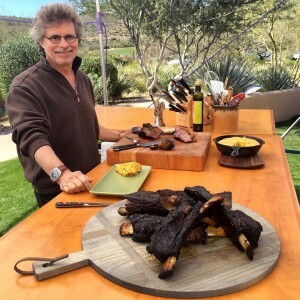 He obsesses over each word to convey how excited he is about each dish, why he chose to include it in the show’s repertoire, and why you should try it. Our producer, Matt Cohen, will now weave many hundreds of hours of footage into 13 coherent shows, working under an insanely tight deadline to get the shows on the air by July 4th. Helping him will be film editor Ryan Kollmorgen and Matt’s assistant producer, the tireless and detail-oriented Gwenn Williams. Frank Batavick represented the interests of Maryland Public Television on the set. Jacqueline Hosmer, a nurse, film school grad, and former bush pilot, proved herself to be a “Jacque of all trades,” a helpful last-minute addition to the crew. 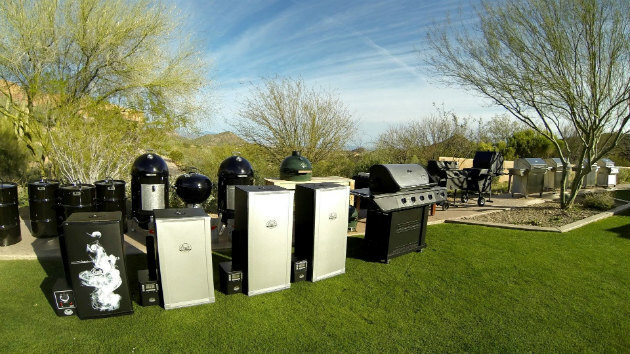 Our smoker and grill roster included Bradley electric smokers, Big Green Eggs, Camerons Stovetop Smoker Cookers, massive Horizon offset barrel smokers, Kalamazoo tri-fuel grills, Memphis Wood Fire Grills, Pit Barrel Cookers, Smoking Guns, Weber Smokey Mountains and Xtreme smokers from Kansas City, with mountains of Kingsford charcoal to fuel them and a squadron of ThermoWorks thermometers to make sure we hit the right temperature. On good nights, we washed it all down with malbec from Trivento Winery in Argentina. Favorite recipes? A tough call, but mine had to be the authentic jerk chicken Steven made in collaboration with Gary Feblowitz. Gary is not only an award-winning cameraman, but the only man in the U.S. authorized to import pimento wood from Jamaica. (Find his products at pimentowood.com.) Other jaw-droppers? Prime rib spit-roasted, then cut into steaks and grilled over wood. Monster smoked beef ribs and a whole smoked beef tenderloin. Home-cured bacon and a Tulsa torpedo (a.k.a. fattie)—the latter smoked in bacon weave. I loved the Irish bacon and pastrami, too. Hmmmm … I guess I can’t decide. An honest “behind the scenes” story wouldn’t be complete without mentioning some of the challenges. Have you ever heard of javelinas (pronounced “have-a-leenas”)? Indigenous to these parts, they look like feral pigs, but are actually large rodents (2-1/2 to 3 feet long). Apparently attracted by the fantastic food smells, they occasionally stormed the set, which led to lots of yelling and waving of arms. Javelinas live in the bush and stone caves surrounding the set, travel in packs, and have little ones in tow this time of year, which makes them more aggressive. A security guard explained how to dress and barbecue them, but Steven did not embrace the idea. The site where we shot Project Smoke was stunning to anyone who appreciates the desert. Unfortunately, it was directly in the path of commercial and private flights from Tucson International Airport as well as F-16s, sometimes in formations of four, from nearby Davis-Monthan Air Force Base. Our soundman, Michael, had to frequently stop the shoot mid-sentence. High winds and rain interrupted production several times. (What? This is the desert, right?) Seems the airstream bedeviling the rest of the country with cold weather also harried us. Ditto for the temperatures in the 40s before sunrise and after sunset. Luckily, I brought a hooded down parka with me. Steven, who’s accustomed to Miami, relied on chimney starters for warmth on night shoots. But we powered through it all and ended the shoot with a celebratory dinner at the Marriott’s white tablecloth Italian restaurant, Primo. I’m looking forward to working with all these wonderful people again. Please contact your local PBS station to find out when Project Smoke will air in your area! Let the station manager know how much you want to watch it and tell your friends!